Owning an OBD2 scanner is the equivalent of having an automotive expert on standby. This means having access to diagnostic codes that simplify repairs by making it clear what could be wrong and how to address those problems. Before you purchase one of these handy devices, you need to know which models are worth having. Using the wrong model could cause problems ranging from unnecessary repairs to neglecting problems that need immediate attention. In this guide to finding the best on-board scanner, we will go over the best three options in various price ranges. We have also included a list of important features to consider before making your final decision about which scanner is right for you. The Innova 3150 Diagnostic Code Reader is the best on-board scanning tool that money can buy. It can diagnose problems in both old and new vehicles with ease and accuracy. This diagnostics tool can diagnose problems and provide the most likely solutions for almost any automobile made after 1996. Compact, accurate, and affordable, this diagnostic code reader can pay for itself after a single use. Being able to diagnose problems with a vehicle while skipping the high dealership fees means being able to address problems at a fraction of the cost in most cases. It can even perform emissions testing, eliminating surprises during required annual government smog testing. The Innova 3150 is small enough to fit in most glove compartments. Its dimensions are 11 x 7.8 x 3 inches. At only 3 pounds, the device is lightweight enough to provide ease of use while obtaining codes. This model refreshes every 30 seconds which helps tremendously with the coded data verification process, ensuring that you get the right codes to address problems with ease and accuracy. It also ensures that you are quickly aware when the problem has been resolved. Codes for both foreign and domestic vehicles can be accessed with the Innova. This is useful for someone who plans to use this device in a shop that services lots of different cars. Being able to pull codes on any vehicle is incredibly useful when the need arises, even if it is just to help a coworker find out why his or her check engine light is on. Battery backup means the device will work even when the engine is off. This is especially useful when diagnosing problems on a vehicle that won’t start. LED lights make the display easy to read, making it possible to get the right diagnostic codes day or night. If you want accurate code readings every time, the Innova has you covered. The built-in USB tool allows you to receive regular updates and upgrades. As new codes become available for newer vehicles, your Innova can connect to the internet and download that new information. Models that don’t offer this feature can sometimes be rendered out of date very quickly. Free technical support is top-notch with toll-free support available 7 days a week. The company uses the same ASE certified staff members that design the products to answer customer questions. The Innova does the work of a far more expensive scan tool in addition to performing ABS diagnostics. It allows for emissions testing, updating, and upgrading. The constant update features means you know within seconds whether the repairs you made have fixed the problem. This is a great product for the advanced do-it-yourself automotive repair person. Those less experienced in making repairs are likely to require professional assistance in actually performing the work after reading the diagnostic codes. However, for those who would prefer taking a car in for service armed with some background knowledge of the problem that needs to be addressed, even those who do not plan to perform repairs themselves could benefit from having this code reader. If you want to purchase a reliable, high quality diagnostic code reader, the Innova gives you the most bang for your buck. It offers all the features a person would want in an on-board scanner without being unreasonably expensive. The BlueDriver Bluetooth Professional is the only diagnostic code reader on our list that is actually an app. It works with iPads, iPhones, and Android devices. This licensed app was developed by the Professional Engineers of North America and is trusted by professional mechanics around the world. The power of the internet gives immediate access to more than 4.3 million fixes for all sorts of car problems. The BlueDriver app does everything that other handheld, standalone code readers do and more. In fact, scanners with similar features can cost more than $500. This app can even be used to clear airbag codes, transmission codes, and ABS codes. It provides repair reports with code definitions, causes, and fixes. It features freeze frames that provide a snapshot of the vehicle when the code was stored. The app is simple to install using Plug and Play technology. A user’s manual is available in the app under the “more” tap to provide user instructions. BlueDriver works with all vehicle models, foreign and domestic, that are 1996 or newer. It also works with all diesel trucks that are 2004 and newer. Those who prefer the simplicity of being able to use your current Apple or Android device to perform diagnostics will love the convenience of BlueDriver. 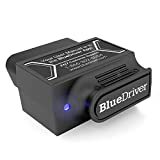 BlueDriver is easy to connect to your automobile using your Bluetooth The sensor can be left plugged into the vehicle at all times and to as many vehicles as you want. A feature is included within the application that ensures your battery will not be drained by the device. In the past, the first five repair reports were free, but all vehicle repair reports are now free. This device provides so much data that, unless you’re a professional mechanic, you probably will not be able to use it all. However, any data you could possibly want about your vehicle is available. For some models, even fuel information can be tracked using live data. The app allows you to clear codes after accessing them to determine whether a problem was a one time occurrence or whether it is an ongoing and recurring problem. The one problem some user’s experience is that the device can drop the Bluetooth connection. Another complaint is that it cannot scan a vehicle’s vin number from a bar code. However, none of the handheld devices offer this functionality, so it’s certainly not a deal breaker. It is simply a minor inconvenience. Overall, the BlueDriver is an all-around winner. The only downside is that it does require the use of a smartphone. This means if the phone is inaccessible or not working for any reason, you will not be able to pull diagnostic codes. In today’s smartphone-powered world, this is only a minor concern that would rarely be a problem for most people. Those who prefer a dedicated device should look elsewhere, but for those who like integrating and streamlining through smartphone technology, this is the winner. Our bronze pick is the Autel 519 AutoLink. It costs less than the BlueDriver or the Innova and provides lots of features that make it one of our favorites. The unit can provide a complete diagnosis for comprehensive troubleshooting, and it has a color display along with a built-in speaker. The device also includes code tips that save time and make quicker repairs possible. The Autel easily and quickly diagnoses the cause of a check engine light being on. It can also turn the check engine light off after the codes have been pulled. This saves users a trip to the service station to have the light turned off once the problem has been addressed. In addition to providing codes, the quick tips offers advice on how to actually fix the problem. This is an invaluable tool for amateurs doing their own repairs. The display lets the user know what is wrong and what to do about it. For someone who is learning how to fix their own vehicle, this feature is the most important selling point. The AutoLink can be updated using a computer and a USB port. This feature is usually not included in competitor’s products in the same price range, but the feature means the device can have newer diagnostic information uploaded to it as new codes and descriptions are released. Models that do not offer this feature tend to become outdated rather quickly. This feature-filled model is full of extras that someone doing their own repairs would likely never need. Unless a person owns a garage and works on lots of different cars on a regular basis, this model provides everything a person needs and then some. Home mechanics will find that this device is all they will ever need for the most common diagnostics. It works for vehicles made in 1996 and later and has code information for both foreign and domestic vehicles. It comes with a detailed and comprehensive manual that makes the device even easier to use. The device is powered by the vehicle’s battery, so it does not require batteries to be replaced. This does mean the car’s battery needs to be in working order for the device to function, so be sure it has access to power. Once it does, you are ready to pull codes. The AutoLink lets the user know every possible cause of a particular code coming up, which is useful when troubleshooting as this can prevent unnecessary repairs. Knowing that there are multiple reasons why a certain code might come up means that each potential problem can be considered before making actual repairs. This can save lots of money in unnecessary repairs and replacements. Although the AutoLink only made our third place spot, it still comes highly recommended. We love that it offers ease of use, built in codes, and quick fix solutions without requiring the use of a laptop. We also really love the price. While it’s not our official cheap pick, this diagnostic code reader is significantly cheaper than many lower quality products on the market. The Autel brand makes our list twice because the company makes excellent products in a variety of price ranges. For those who want the quality of an Autel while paying less than the AL519 costs, look no further than the MaxiScan. The Autel MaxiScan MS300 CAN is our cheap pick because people who buy it tend to love it. It covers all the basic functions one generally wants in diagnostic reader. It can read and clear codes, turn off a check engine light, and can support multiple troubleshooting code requests simultaneously. It also comes with a free CD that includes more than 7,000 code definitions. The Autel works on all vehicles foreign and domestic beginning with those made in 1996 and covering all newer models. It comes in small housing without sacrificing power. Lightweight, yet durable, this model is easy-to-use and will not get in the way while trying to pull codes. People who want the basic functions of a scanner tend to be thrilled with this model because it costs a fraction of what high end models do while providing all the basic functionality. For an individual who doesn’t plan on using the device for multiple vehicles, this model is all you need. For those on a budget, it is the only model we recommend. This model is incredibly easy to use. As one buyer noted, “If you can replace a light bulb, you can use this device.” All you have to do is hook it up to the computer terminal under the dashboard of your vehicle, and it provides a code that you can look up using the CD that’s included with purchase. For do-it-yourselfers, there’s no easier way to perform diagnostics for cheap. For those who do not plan to do their own repairs, it’s a cheap way to ensure that you walk into the dealer or repair shop armed with basic knowledge of what problem needs to be addressed. 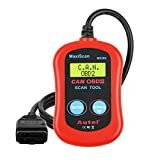 The Autel MaxiScan features a brightly lit and easy-to-read LCD screen that displays codes and definitions. It also features a multilingual menu for those who do not speak English. It does rely on the car battery for its power and does not include backup battery capabilities. For this reason, it is necessary that the car battery be in working order to pull codes using this model. After reading your codes, the MaxiScan will clear them. This will turn the check engine light off. The status of your vehicle emissions testing is provided by an LED on the front of the unit. Vehicle health monitors that provide instant vehicle emissions checks can help ensure that a vehicle meets the standards for legally allowable emission levels. Most states require a vehicle to pass a vehicle emissions check annually. This is generally done when the automobile owner is renewing the registration. Being aware of any problems related to emissions and addressing those before going for the annual inspection can save both time and money. Having access to a vehicle emissions checks at any given time eliminates surprises during official emissions testing. Most OBDII scanners have this feature. However, not all of them do. Each one of our picks allows for on-board emissions testing. Being able to directly access code definitions adds a level of efficiency and convenience. The best OBD2 scanners do provide access to the definitions for each code in multiple languages. Those that do offer this feature need to allow for updating so they are not quickly rendered obsolete. Those scanners that do not provide code definitions require the user to input the codes generated by the scanner into an online database. It is always advisable to double check the definition of a code before buying parts or making repairs, since errors can occur and information can be outdated. The fix assist with repair tips feature is only available with higher end scanners. For those who are doing their own personal vehicle repairs, this feature can pay for itself with a single use by offering tips that make it possible to skip the dealer or repair shop. Having access to professional insights and repair tips is worth the additional cost. This narrows down potential causes and solutions for the problem indicated by the code being displayed by your vehicle. All of our recommendations include fix assist with repair tips. Be aware that not all scanners offer this feature, so double check if purchasing on that isn’t included on this list. Any high-quality digital hardware is going to provide a means for offering updates and upgrades. This includes automotive scanners. Not all scanners offer a USB tool, but it is highly recommended to look for one that does. Updates can include corrections to code errors, provide annual updates to give users access to information about brand new vehicle models, and improved functionality as technology improves. Don’t waste your money on a OBD2 scanner that doesn’t offer a USB updating feature. Whether the scanner actually comes with the USB cable included is not very important. These cables are relatively inexpensive to purchase separately, but be sure to opt for a scanner that features a USB tool. If you are looking for a good diagnostic code reader, look no further than this comprehensive list of the best models on the market. Each of these devices can provide the codes needed to troubleshoot problems with vehicles, reset the check engine light once the problem has been determined, and check vehicle emissions. Having your own code reader can save time and money by making it possible to know what’s wrong with your vehicle before taking it to a service station. For those who opt to do their own repairs, having a diagnostic code reader is essential to determining what repairs are needed.